Poetry is everywhere, I tell my young students. On cereal boxes, billboards, advertisements. Look to road signs, announcements, sidewalks. Search your lives, I say, in the quiet space life expands. 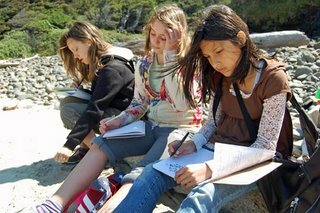 I spent last week in a summer camp that combined outdoor adventures with writing activities. 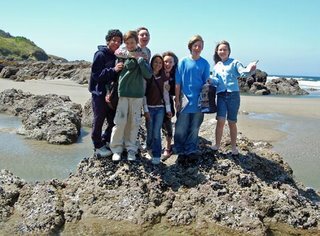 Every day offered field trips with opportunities to reflect and write. We explored spaces and places, by turns busy and giddy, quiet and thoughtful. We walked the span of a historic bridge, hiked from forest to sea, strolled through a working bayfront, kayaked a bay, and bicycled around town. Though the week was full of laughs and adventure, we also made room for quiet. We invited our minds to question and wander. Rayn, 11, wondered why firetrucks are red. Is red, she wrote, the color of trust? as we admire their beauty. or hands, or your mind. is almost enough to put you to sleep. When you catch the breeze you feel fresh. could wake up and it would be gone. Between the busy adventures, the Summer Camp Writers crawled into quiet to find beauty tucked around and within them. And I, grateful and encouraged, applauded their every word.